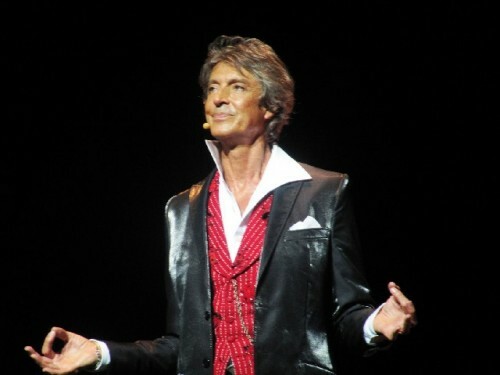 Tommy Tune performed Steps in Time at the Colonial Theatre. Giuliano photos. 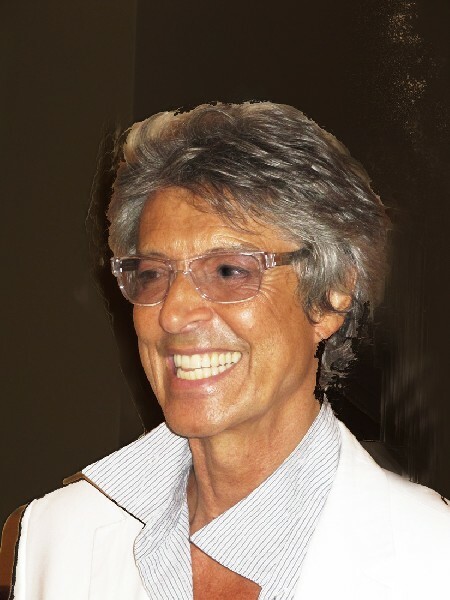 The megawatt smile of Tommy Tune. 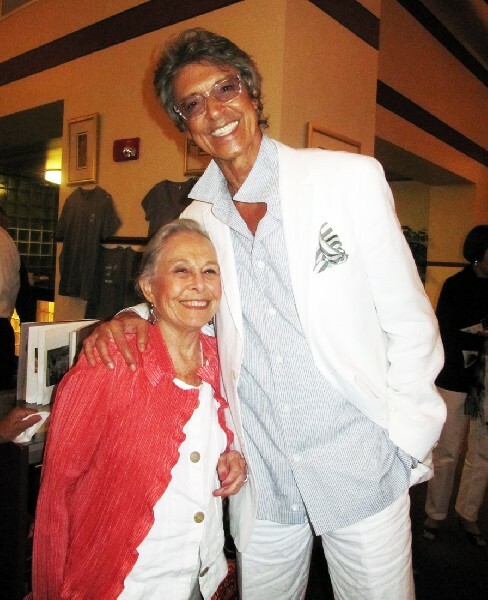 With Berkshire resident the dancer Marge Champion. 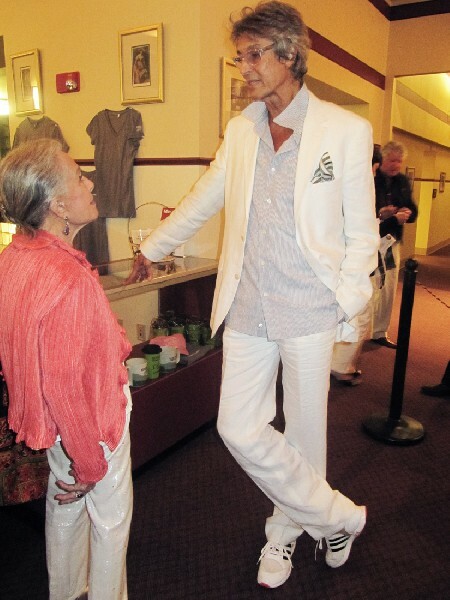 Nine time Tony Winner Tommy Tune tapped his way across the stage of the Colonial Theatre last night with his retrospective of 50 years in show business Steps in Time. The tall and lanky Texan, at six feet six and a half inches, who was born in 1939, is still going strong. 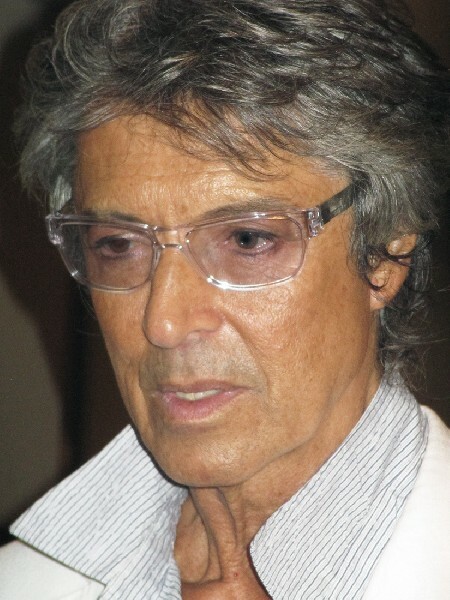 Tune, now in his 70s, looked so tanned and terrific that he could be the poster boy for a Juan Ponce de León campaign mounted by AARP. Looking about at the sizeable audience in the 800 seat Colonial Theatre it seemed as though the seniors were out in force to support one of their own. We were surprised to find ourselves below the median age. The show billed as Steps in Time featured Tune pitter pattering through the decades in song and dance. There were taps on his red cowboy boots. Kind of a nice Texan touch. The evening started with a brief demonstration of time steps. Single, double, triple and then variations of gliding movements. This was followed by a brief quiz. So there was a learning curve as we followed his life and career from a gangly kid in Texas to first success on Broadway and duets with a plethora of stars. One was Marge Champion, a Berkshire resident, whom Tune graciously pointed out. Later they chatted in the lobby during a post show reception. Tune recalled that they made an eight minute movie about his wish to have a star along Hollywood Boulevard. That dream later came true as Tune informed us in loving detail. The megawatt charm and toothy smile seemed to channel aspects of Liberace, Tiny Tim, and Pee Wee Herman if only they were taller or could sing and dance. The performance was campy to be sure but so sweet, sincere and generous that it was impossible to resist. Time, alas, looking between the cracks has taken a toll. The range of his voice is limited. Songs were crooned more than belted out. And the signature dancing was smooth and terrific but less than dazzling. There were hardly any spectacular moments. Mostly Tune appears to be pacing himself and, as he told me in a phone conversation, with tap a dancer can go on forever. Bet on it. Another anecdote related touring with the legendary dancer Charles “Honi” Coles. He told us how Coles taught him in his dancing to be “nonchalant.” They were on tour with the Broadway hit “My One and Only.” Something happened. A song was skipped and Coles indicated to Tune that something was wrong. Then, on cue, he executed a number slowly but “perfectly.” It seems that he had suffered a stroke on stage and it was to be his last performance. While Tune is featured he has for many years toured with the Manhattan Rhythm Kings. In addition to the band two visibly shorter men join him for trios. It stretched out the program and provided some comic interludes. Mostly it was a bare stage production. One could see the back wall which played into the act when Tune, after encores, departed through the stage door. There were a few props. One of which was a ladder that Tune climbed up and straddled to sing the Carole King standard “Up on the Roof.” It was a nice touch. Thanks Tommy for a delightful evening. As they say in Texas, Y’all come back, yah heah.